If the next generation of students is to help us solve issues related to sustainability, we need to inspire them to think about the world and our relationship to it with fresh eyes and an open mind. 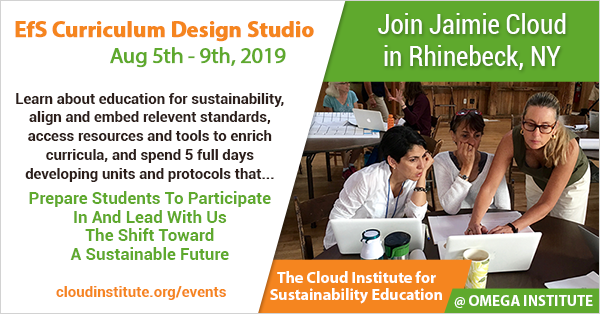 The Cloud Institute's Annual Curriculum Design Studio will once again be held at The Omega Institute in Rhinebeck, NY. Join us for an immersive Introduction to Education for Sustainability (EfS) and 5 Days of Curriculum Design and Coaching. Meet us at Omega and gain access to expertise, resources and tools required to design elegant curricula for use in the classroom, protocols for professional development, or action plans designed to implement EfS change initiatives in schools and communities. Onsite lodging and meals optional. The Education for Sustainability (EfS) Framework is an evidence-based, transformative learning process developed by The Cloud Institute. It is based on systems thinking, sustainable economics, and the science of sustainability. Instead of teaching kids about sustainability, EfS teaches them the knowledge, skills, attitudes, and habits of mind required to become responsible citizens who can achieve economic prosperity and restore the health of the living systems upon which our lives depend.